Celebrating the life of Joseph Olin Ivey, Jr.
Obituary for Joseph Olin Ivey, Jr.
Joseph Olin Ivey, Jr. passed peacefully into eternity on Monday, July 30, 2018, surrounded by his family. Born in southwest Fulton County on November 26, 1932, to Joseph Olin Ivey and Iva Goolsby Ivey, he graduated from West Fulton High School and attended Georgia Tech. While at Tech he was in the Naval Reserve and then took an active duty commission flying the P-2V Neptune from Alaska, Okinawa, and Hawaii. He traded in his Navy wings for a pair at Delta Airlines in 1956, retiring in 1992 with over 36 years and 25,000 hours with Delta. While still in the Navy, he married his hometown sweetheart, Barbara Boyd. They settled in Fayette County in 1960 and raised their four children in a home so marked by hospitality that it was sometimes called the Ivey Hilton. Joe entered into relationship with God as a young man and as his faith grew he shared the joy of life in Christ with those he encountered. 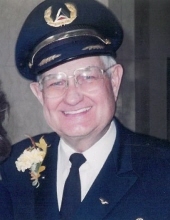 That lifelong passion led to his involvement in founding the Fellowship of Christian Airline Personnel and Grace Evangelical Church in the early 70’s. In fact, their home hosted the organizational meetings for both of those ministries. After many years of Joe and Barbara’s life together parenting, grand-parenting and ministering to others through hospitality, Grace Church, FCAP and home Bible studies, Barbara developed Alzheimer’s disease. Joe cared for her faithfully and attentively for ten years before her death in 2006. In an act of grace for which Joe and his children always expressed thanksgiving, Pat Brown of Fayetteville entered his life. They were married in July of 2008 and enjoyed a full and active life together until just days before Joe’s sudden illness. Joe was predeceased by his parents, his first wife, Barbara Boyd Ivey, and two dear brothers-in-law. He is survived by his wife of ten years, Pat Brown Ivey, his sisters Wanslie Poole and Elaine Payne, his brother-in-law and sister-in-law George and Mary Alice Boyd, his four children and spouses: Malia and Chuck Bergstrom, Walter and Rachel Ivey, Suellen and Andres Silva, and Andy and Rowena Ivey; seven grandchildren and spouses: Austin and Holly Bergstrom, Ryan and Chelsea Ivey, Claire and Jeremiah Peery, Bethany Ivey, Elena and Zachary Carden, Evan Ivey, Carlos Ivey; and eight great-grandchildren: Kristen and Daniel Ivey, Jack, Nate, Lucy and Reese Bergstrom, Isaiah and Ender Peery; stepson Seth and Daphne Brown, and many nieces and nephews. We, the family, also marvel and give thanks for the host of friends and colleagues, some surviving and others who proceeded him into heaven, who have enriched Joe’s life and ours. A Memorial Service will be held on Saturday, August 4, 2018 at 1:00 PM at Grace Evangelical Church, 164 Flat Creek Trail, Fayetteville, with Rev. Howard Dial, Paul Curtis - FCAP, and Pastor Gary Franklin officiating. A coffee/reception will follow the service at the church. A private family burial will take place at Westminster Memorial Gardens, Peachtree City, GA. The family will receive friends Friday evening, August 3, 2018 from 6:00-8:00 pm at Carl J. Mowell & Son Funeral Home, Fayetteville GA. Flowers are welcome, but donations in Joe’s memory may be made to the Fellowship of Christian Airline Personnel, https://fcap.org/. To send flowers or a remembrance gift to the family of Joseph Olin Ivey, Jr., please visit our Tribute Store. "Email Address" would like to share the life celebration of Joseph Olin Ivey, Jr.. Click on the "link" to go to share a favorite memory or leave a condolence message for the family.